Buda and Pest, once two contrasting cities laying opposite each other across the river Danube, merged in the 1870’s to form what we know today as the Hungarian capital of Budapest. The personalities remain today with noble buildings like the Hapsburg palace perched high on the hilltops of the former Buda from which one can take in the sweeping views of the flatlands of Pest. 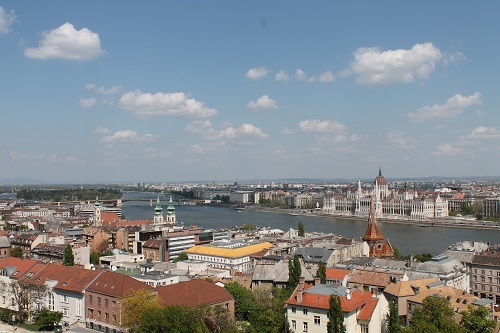 Pest could be perceived as the poorer sister but is in fact the commercial heart of the city and home to a vast array of cafes, bars, clubs, shops and hotels. Il Terzo Cerchio – A traditional Italian restaurant, with seasonal ingredients (asparagus soup to die for) delicious fish, great prices and with rave reviews. If it’s traditional Hungarian food you are looking for, look no further than Hugarikum Bistro. Here you will find hearty, home style cooking and vast array of Hungarian delicacies. Coffee culture dominates the day in Budapest. The selection of cakes and strudels are only beaten by the number of coffee houses to choose from. Take in the grandiose Viennese style surroundings whilst nibbling on delicious sweet treats to the sound of a live pianist at the famous Book Cafe, located on the second floor of the Alexandra book store. Corinthia Hotel Budapest – Beautifully restored for a new generation of traveller, Corinthia Hotel Budapest is one of the grandest hotels in the city with an imposing Neo-classical façade and soaring glass atrium. Close to historical and cultural landmarks, it offers a choice of elegant eateries and destination bars, such as the authentic Far Eastern Rickshaw restaurant or the fine dining restaurant, Brasserie & Atrium. If it’s rejuvenation and relaxation you seek the Art Deco style Royal Spa provides some of the best pampering facilities in the city. The Aria Situated right next to St Stephens Basilica in the heart of the city, this newly opened luxury boutique hotel is destined to be a firm favourite. A complete sensory experience, the stunning interior, roof top bar and breathtaking spa are inspired by music. Guests at the Aria enjoy a range of complimentary services including breakfast, wine and cheese and free wifi. 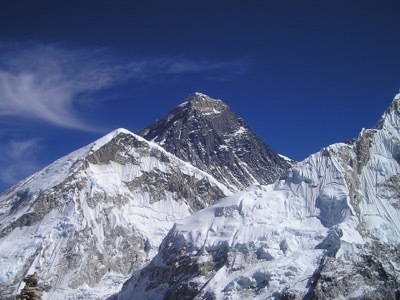 The Continental Hotel – This four-star hotel provides excellent value for money. The Continental hotel Is located close to the Jewish quarter and to arguably the best restaurants and nightlife in the city. The hotel is built on the site of the legendary Hungarian Spa and the modern roof top spa and pool provide a peaceful escape with great views across the city. Yes, it’s touristy but there’s little better way to explore the city than by an evening cruise down the Danube. The fairy tale river front is simply magical at night. The twinkling lights reflect on the water and the Parliament building and Buda Castle provide an awe inspiring majestic backdrop. Budapest is a great walking city, with so much to see, I’d recommend taking your time and doing it all on foot. 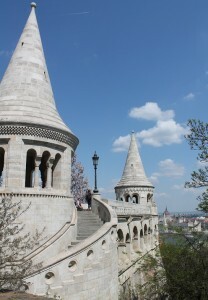 Yes the hike up the hill to Buda is a bit of stretch but can be done comfortably in about 20 minutes. Stroll along the top, taking in the palaces, museums and pastel coloured buildings to the beautiful Fishermans Bastion a modern day fort complete with turrets. Stop for lunch at the Terrace cafe with arguably the best views across the city. The Hungarian State Opera has an impressive programme of ballet and opera but gets booked up well in advance so you need to book ahead before you travel. After a few days of walking you’ll be ready for a little bit of R&R and unique to Budapest are the scores of spas and thermal baths. 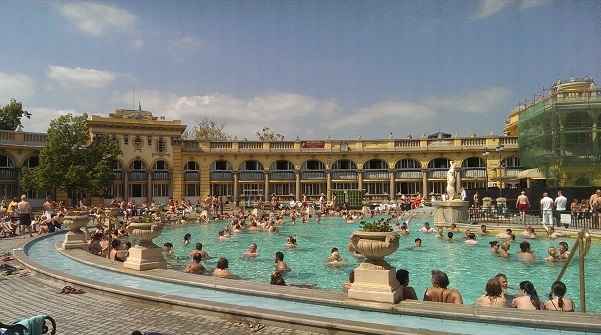 The most famous of which are the Szecheny Thermal Baths whilst not quite a luxury spa has tens of thermal and mineral pools, saunas and steam rooms. Massages and basic spa treatments are available but note cards are not accepted you, need to pay for everything in cash including a heft deposit on hired robes and towels. Whether it’ a romantic break, girly weekend or shopping spree, Budapest makes a great city break destination. Easy to navigate, safe and teeming with culture and great food you really can’t go wrong. Your pound goes a long way. 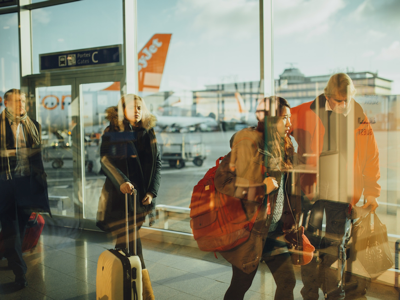 Budapest is easily accessible by the low-cost carriers from most UK airports. Corinthia hotel Maiden-Voyage.com member offer: Quote “MDVOY” to receive an exclusive Maiden Voyage discount of 25% off best available rate, when staying for 3 nights or more.